Because hydrogen has the electron configuration 1s1, its usual position in the periodic table is above the alkali metals. However, hydrogen does not truly belong to any particular group. Unlike the alkali metals, it is a nonmetal that occurs as a colorless diatomic gas, H2(g), under most conditions. We saw in Equation 7.16 that hydrogen reacts with active metals to form solid metal hydrides that contain the hydride ion, H−. The fact that hydrogen can gain an electron further illustrates that it is not truly an alkali metal. In fact, in terms of chemical reactivity, hydrogen has more in common with the halogens than with the alkali metals. As we proceed down group 6A, there is a change from nonmetallic to metallic character (Figure 7.12). Oxygen, sulfur, and selenium are typical nonmetals. Tellurium is a metalloid, and polonium, which is radioactive and quite rare, is a metal. Oxygen is a colorless gas at room temperature; all of the other members of group 6A are solids. Some of the physical properties of the group 6A elements are given in TABLE 7.6. This reaction is strongly endothermic, telling us that O3 is less stable than O2. Although both O2 and O3 are colorless and therefore do not absorb visible light, O3 absorbs certain wavelengths of ultraviolet light that O2 does not. Because of this difference, the presence of ozone in the upper atmosphere is beneficial, filtering out harmful UV light. Ozone and oxygen also have different chemical properties. Ozone, which has a pungent odor, is a powerful oxidizing agent. Because of this property, ozone is sometimes added to water to kill bacteria or used in low levels to help to purify air. However, the reactivity of ozone also makes its presence in polluted air near Earth's surface detrimental to human health. 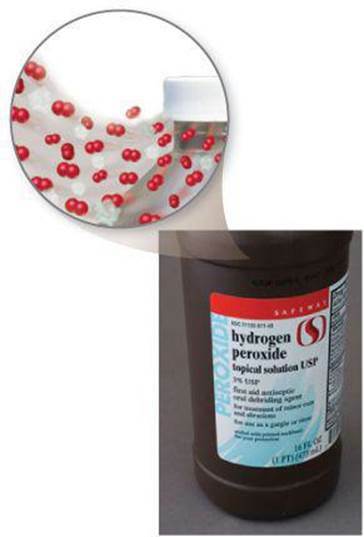 FIGURE 7.25 Hydrogen peroxide solution in bottle with venting cap. 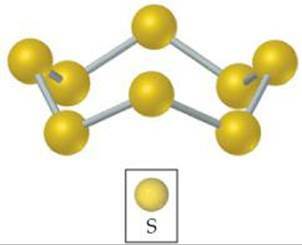 FIGURE 7.26 Elemental sulfur exists as the S8 molecule. At room temperature, this is the most common allotropic form of sulfur. Oxygen has a great tendency to attract electrons from other elements (to oxidize them). Oxygen in combination with a metal is almost always present as the oxide ion, O2−. This ion has a noble-gas configuration and is particularly stable. As shown in Equation 7.26, the formation of nonmetal oxides is also often very exothermic and thus energetically favorable. For this reason, bottles of aqueous hydrogen peroxide are topped with caps that are able to release the O2(g) produced before the pressure inside becomes too great ( FIGURE 7.25). Hydrogen peroxide is light sensitive and so is stored in brown bottles because its O—O bond is relatively weak. If we assume that the brown bottle absorbs all visible wavelengths of light (Section 6.1), how might you estimate the energy of the O—O bond in hydrogen peroxide? After oxygen, the most important member of group 6A is sulfur. This element exists in several allotropic forms, the most common and stable of which is the yellow solid having the molecular formula S8. This molecule consists of an eight-membered ring of sulfur atoms ( FIGURE 7.26). Even though solid sulfur consists of S8 rings, we usually write it simply as S(s) in chemical equations to simplify the stoichiometric coefficients. Below sulfur in group 6A is selenium, Se. This relatively rare element is essential for life in trace quantities, although it is toxic at high doses. There are many allotropes of Se, including several eight-membered ring structures that resemble the S8 ring. The next element in the group is tellurium, Te. Its elemental structure is even more complex than that of Se, consisting of long, twisted chains of Te—Te bonds. Both Se and Te favor the —2 oxidation state, as do O and S.
From O to S to Se to Te, the elements form larger and larger molecules and become increasingly metallic. The thermal stability of group 6A compounds with hydrogen decreases down the column: H2O > H2S > H2Se > H2Te, with H2O, water, being the most stable of the series. Some of the properties of the group 7A elements, the halogens, are given in TABLE 7.7. Astatine, which is both extremely rare and radioactive, is omitted because many of its properties are not yet known. Unlike the group 6A elements, all the halogens are typical nonmetals. Their melting and boiling points increase with increasing atomic number. Fluorine and chlorine are gases at room temperature, bromine is a liquid, and iodine is a solid. Each element consists of diatomic molecules: F2, Cl2, Br2, and I2 ( FIGURE 7.27). FIGURE 7.27 The elemental halogens exist as diatomic molecules. The halogens do not exist as X8 molecules like sulfur and selenium do. Can you speculate why? As a result, fluorine gas is difficult and dangerous to use in the laboratory, requiring specialized equipment. Chlorine is often added to drinking water and swimming pools, where the HOCl(aq) that is generated serves as a disinfectant. These compounds are all very soluble in water and dissolve to form the hydrohalic acids. As we discussed in Section 4.3, HCl(aq), HBr(aq), and HI(aq) are strong acids, whereas HF(aq) is a weak acid. Can you use data in Table 7.7 to provide estimates for the atomic radius and first ionization energy of an astatine atom? The group 8A elements, known as the noble gases, are all nonmetals that are gases at room temperature. They are all monatomic (that is, they consist of single atoms rather than molecules). Some physical properties of the noble-gas elements are listed in TABLE 7.8. The high radioactivity of radon (Rn, atomic number 86) has limited the study of its reaction chemistry and some of its properties. The noble gases have completely filled s and p subshells. All elements of group 8A have large first ionization energies, and we see the expected decrease as we move down the column. Because the noble gases possess such stable electron configurations, they are exceptionally unreactive. In fact, until the early 1960s the elements were called the inert gases because they were thought to be incapable of forming chemical compounds. In 1962, Neil Bartlett at the University of British Columbia reasoned that the ionization energy of Xe might be low enough to allow it to form compounds. In order for this to happen, Xe would have to react with a substance with an extremely high ability to remove electrons from other substances, such as fluorine. Bartlett synthesized the first noble-gas compound by combining Xe with the fluorine-containing compound PtF6. Xenon also reacts directly with F2(g) to form the molecular compounds XeF2, XeF4, and XeF6. Krypton has a higher I1 value than xenon and is therefore less reactive. In fact, only a single stable compound of krypton is known, KrF2. In 2000, Finnish scientists reported the first neutral molecule that contains argon, the HArF molecule, which is stable only at low temperatures. The element bismuth (Bi, atomic number 83) is the heaviest member of group 5A. A salt of the element, bismuth subsalicylate, is the active ingredient in Pepto-Bismol®, an over-the-counter medication for gastric distress. (a) The bonding atomic radii of thallium (Tl) and lead (Pb) are 1.48 Å and 1.47 Å, respectively. Using these values and those in Figure 7.6, predict the bonding atomic radius of the element bismuth (Bi). Explain your answer. (b) What accounts for the general increase in atomic radius going down the group 5A elements? (c) Another major use of bismuth has been as an ingredient in low-melting metal alloys, such as those used in fire sprinkler systems and in typesetting. The element itself is a brittle white crystalline solid. How do these characteristics fit with the fact that bismuth is in the same periodic group with such nonmetallic elements as nitrogen and phosphorus? (d) Bi2O3 is a basic oxide. Write a balanced chemical equation for its reaction with dilute nitric acid. If 6.77 g of Bi2O3 is dissolved in dilute acidic solution to make 0.500 L of solution, what is the molarity of the solution of Bi3+ ion? (e) 209Bi is the heaviest stable isotope of any element. How many protons and neutrons are present in this nucleus? (f) The density of Bi at 25 °C is 9.808 g/cm3. How many Bi atoms are present in a cube of the element that is 5.00 cm on each edge? How many moles of the element are present? (a) Note that there is a gradual decrease in radius of the elements in groups 3A–5A as we proceed across the fifth period, that is, in the series In–Sn–Sb. Therefore, it is reasonable to expect a decrease of about 0.02 Å as we move from Pb to Bi, leading to an estimate of 1.45 Å. The tabulated value is 1.46 Å. (b) The general increase in radius with increasing atomic number in the group 5A elements occurs because additional shells of electrons are being added, with corresponding increases in nuclear charge. The core electrons in each case largely screen the outermost electrons from the nucleus, so the effective nuclear charge does not vary greatly as we go to higher atomic numbers. However, the principal quantum number, n, of the outermost electrons steadily increases, with a corresponding increase in orbital radius. 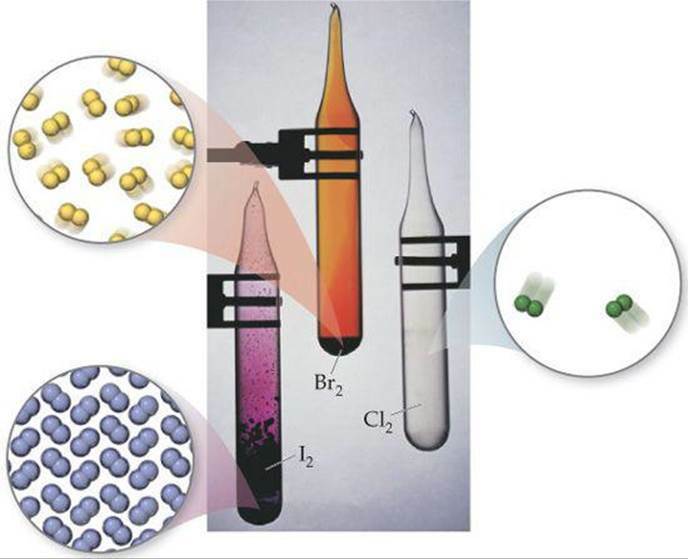 (c) The contrast between the properties of bismuth and those of nitrogen and phosphorus illustrates the general rule that there is a trend toward increased metallic character as we move down in a given group. Bismuth, in fact, is a metal. The increased metallic character occurs because the outermost electrons are more readily lost in bonding, a trend that is consistent with its lower ionization energy. (e) We can proceed as in Section 2.3. Bismuth is element 83; there are therefore 83 protons in the nucleus. Because the atomic mass number is 209, there are 209 − 83 = 126 neutrons in the nucleus.